Rock Star was created by Russ Weil, son of renowned herbalist Dr. Michael Weiner, PhD., and the company lives up to and heavily promotes the rock star/party image. The official website is black and red and full of celebrity shots drinking or holding Rock Star beverages, and has a rocker 'tude that's not hard to miss. RockStar69 and Penthouse (magazine), successfully collaborated in a partnership hosting the largest celebrity party for the 2006 Super Bowl, and the company also holds regular modelling contests in search of Rockstar billboard babes. 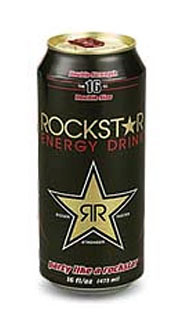 Rockstar claims to be the first energy drink to offer multiple sizes of a brand favorite, and currently comes in six varieties, including a diet version which is aspartame-free, using instead a blend of Splenda-brand sucralose and acesulfame potassium (Ace-K). Slogan: Party like a Rockstar! Variations: Rockstar Energy Drink (black can), Diet Rockstar Energy Drink (white can), Rockstar Energy Cola (red can), Rockstar Juiced (orange can), Rockstar Zero Carb (blue can), Rockstar 21 (Alcoholic) and Rockstar Juiced Guava (purple can).